Our October meeting is next Wednesday the 21st at the Aksarben Aquarium. Doors open at 6:30, meeting starts at 7. Stop by early to practice your casting or just chat with members about recent fishing success! Our October Fly of the Month is the Girdle Bug. 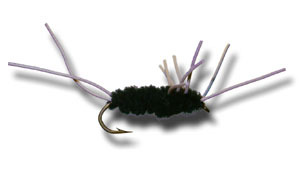 This is a simple stonefly nymph that's a breeze to tie and catches fish like crazy. Instructions to tie this pattern here. Now that I am aware about your next meeting I am sure that it is going to be exciting to be at Aksarben Aquarium for that. There are many new species that they have got in there to see.